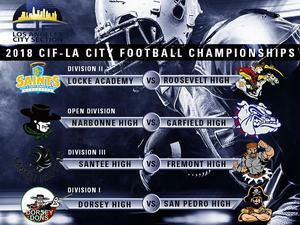 El Camino College, Murdock Stadium will be the site of the Division III, II, I & Open Football Championships. The Stadium is located at 1 Stadium Way, (Redondo Beach Blvd), Torrance, CA 90506 and is easily accessible from the 405 and 91 freeways. There is ample parking available in parking lots F & H access on 1 Stadium Way from Redondo Beach Blvd. Parking is $5.00 per car. Remember to remove all valuables from your vehicle. PUBLIC ENTRANCE - Spectator admission gates will open at 2:00 PM. Ticket booths are located at the South East end of the stadium. Home team spectators are assigned to the EAST side bleachers, visiting team spectators are assigned to the WEST side bleachers. There are no in–and-out allowed - Please inform your school community. Admissions is good for all games on Saturday. All tickets sales will begin two hours prior to the event at the event facility. There will be no advanced tickets sales. Cash or Credit Card purchases will be accepted. The Murdock Stadium offers accommodations for wheelchairs and for spectators with restricted mobility. The stadium features an elevator and ramps to access the lower level of the bleachers. The El Camino Campus Police Department will be the agency responsible for addressing all safety issues that may arise during the game. The CIF LA City Section has hired Security personnel as first responders to any emergency in the stadium. LAUSD may provide additional police presence at their expense.